With the end of April came also the end, for this year at least, of “Confederate History Month,” unfortunately resuscitated by Virginia Governor Bob McDonnell after a long dormancy under the previous two governors. Amidst an outcry that apparently surprised the Regent University law graduate, McDonnell hastily reworded his proclamation with a grudging nod to the impropriety of slavery and the possible existence of other points of view on the matter of a rebellion leading to the country’s bloodiest war. 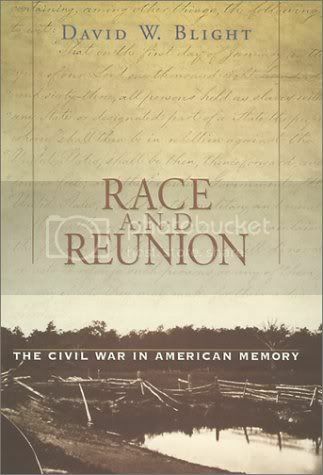 One might reasonably ask why there are no “Union History Month” or “Victory over Treason and Slavery” celebrations — and that, more or less, is what David Blight did in his book “Race and Reunion,” published in 2001. Covering the period from the Emancipation Proclamation to the 50th anniversary of Gettysburg — and the release of the notorious film “Birth of a Nation” — it’s a fascinating read. It’s also — still, going on ten years later — a useful, jolting reminder of just what was lost as remembering the Civil War became more about rehashing every last engagement, and about getting over it, past it, and around it, than about reflecting why it happened — let alone reflecting on the unfinished business of the human and civil rights of black Americans. book or others by Blight. Blight’s research led him to soldiers’ remembrances in periodicals of the time such as Century and Harper’s; to the annals and publications of the Southern Historical Society and the Confederate Veteran, and to the schedules and membership rolls of the United Daughters of the Confederacy. But he also paid attention to the writings and speeches of Frederick Douglass and W.E.B DuBois, the short stories of Ambrose Bierce, and the novels of the unjustly forgotten Albert Tourgee (“only fools forget the causes of war”) or Nelson De Forest — as well as the celebration of Klan terror by authors like Thomas Dixon, Jr, or the perhaps more insidious romanticization of the antebellum South by authors like Thomas Nelson Page or Joel Chandler Harris (“Uncle Remus”). What had happened by 1913 was a “Lost Cause” regional movement as potent, committed, and persistent as the abolition movement had been. What’s more, it arguably had a greater reach (at least within the U.S.), in that ex-Confederates could and did safely peddle their redefinition — for that’s what it was — of the causes and legacy of the Civil War throughout the country, for good money and to plentiful applause. This post announces an ambitious and possibly quixotic effort — the attempt of a legal layperson like myself to launch and carry on a discussion about Benjamin Wittes’ “Law and the Long War: The Future of Justice in the Age of Terror,” published in 2008. Luckily, I’ll be joined in this discussion by my friend “The Talking Dog,” whose legal acumen and training — as well as self-deprecating wit and engaging writing — are always in evidence at his blog of the same name. “TD’s” interviews of lawyers, policy makers, human rights leaders (most recently with NYU’s Karen Greenberg), and even Guantanamo detainees have been genuine journalism, and are among the finest things the American blogosphere has produced. Our plan is to take the book chapter by chapter, at no precise schedule other than to take the chapters in sequence. We hope readers will check Wittes’ book out from the library, borrow it from a friend, or buy a copy for themselves, so they can read along with us and join the discussions we hope for. To leave some time for readers to join in (and for me, at least, to gather my thoughts), our first posts about Wittes’ introduction will be sometime around the middle of next week. At this blog, this post will serve as one “home page” for the overall effort, and the outline above will link to each post as it is written. We’ll also try to provide “prior chapter” and “next chapter” and other useful navigational links within each post, time permitting. Why is this worth doing? I’m tempted to simply answer: what could be more important? Whether it’s always clear or not, our lives and our rights are both at risk. We have to evaluate those risks, and decide what to do about them. For my part, though, this is also partly just an attempt to become more “fluent” in the legal underpinnings of the debates about the habeas corpus and other human rights of detainees, the costs and benefits of the expansion of executive powers, and the conduct of international relations and military force in this so-called “long war” of ours. There are also more immediate reasons to do so: Wittes and his book have proved quite influential, perhaps especially of late. On its publication, the book merited extended discussion at numerous legal blogs, and gained respectful and often warm reviews in the popular media and the academic press. This is a scrupulous and ultimately devastating indictment of the British RAF bombing campaign in Europe and the USAAF one in Japan during World War II. These so-called “area” or (at least in Grayling’s book) “strategic” bombing campaigns had the purpose of creating maximum deaths among citizens of the enemy nation, and of thereby breaking the will and ability to continue supporting their nation’s war effort. Grayling contrasts these campaigns with so-called “precision bombing” attacks — however inaccurate such bombing often was in practice. Examples of the latter include the RAF’s dam-buster or Peenemunde rocket production facility attacks, the USAAF’s attacks on Schweinfurt ball bearing plants, or similarly motivated and targeted attacks on oil and gas production facilities such as those at Leuna or Ploesti. Instead, Grayling focuses especially on “Operation Gomorrah”, the mid-1943 attacks on Hamburg, as a hard case in that the war was not yet won as it arguably was in the more famous cases of Dresden, Hiroshima, or Nagasaki. Grayling finds (and rightly, in my view) that “Gomorrah” served no useful purpose and was immoral, conducted with a view simply to maximum casualties and destruction of civilian infrastructure. * The bombing raid and ones like it may well have qualified as a war crime even by standards prevailing before and after the war (including those employed at the Nuremberg trials). Grayling conveys some of the horror and terror of that attack — streetcar glass melting, follow-on bomber crews able to feel the heat from the first attacks in their planes, at least 45,000 dead. (While Grayling draws on many sources, including W. G. Sebald’s famous “On the Natural History of Destruction,” one eyewitness account — “Der Untergang”,** by Hans-Erich Nossack — is an understated classic in its own right.) It should be noted that Grayling explicitly judges the Holocaust to be worse, but adds that has no bearing on whether “Gomorrah” and similar raids were crimes. Not all of Grayling’s arguments are fully convincing, but to his credit he always considers and evaluates counterarguments. In the main example of this, he argues that morale was if anything hardened and war production was unaffected by area bombing. Yet he also notes that the German war economy had plentiful slave labor and had plundered Europe for raw materials, machinery, and production. *** To employ the kind of analogy Grayling frequently does, if the Nazis devised a machine that repaired factories and fed refugees, but was fueled by concentration camp corpses, would this “success” invalidate attacking those factories and cities? I’m unpersuaded in this respect; the case against “area bombing” ultimately isn’t one of efficacy, but of proportion and humanity. Yet even by the RAF’s lights, Grayling is right to consider the pragmatic military arguments for and against area bombing; a staggering 55,000 RAF bomber crew members lost their lives in the campaign. Grayling disposes effectively of another argument — the diversion of military manpower and materiel (esp. the feared dual antitank/antiaircraft “88s”) to antiaircraft duty within Germany — by pointing out the same diversion would have happened for a “precision” bombing strategy focused on war industries. As Grayling points out, this debate is far from academic or “merely” historical. US military doctrine still holds that economic (not merely military industrial) targets are fair game in war, and that weakening enemy civilian morale is a valid strategic goal of bombing. Both postulates appear to contravene elements of newer Geneva Conventions to which the US is not a signatory — but to which much the rest of the world is. Attacks on civilian targets, or undiscriminating attacks to which too many civilians will fall victim, may also be among the indictments of some US actions in Iraq, such as in Fallujah or Sadr City (quite aside from the necessity of the Iraq war in the first place). But those will be the topics of a different book. * Bomb payloads were calibrated to cause firestorms (hurricane-force winds caused by combined fires, incinerating and suffocating whole city neighborhoods) by inclusion of incendiary devices — and by the inclusion of delayed action bombs calculated to injure or kill firefighters. A version of the latter “one-two punch” tactic was also adopted by some terrorist suicide bomber team attacks in Israel and elsewhere. ** The title of Nossack’s book has been translated as “The End” in English editions. Fair enough, but the word is more complex than that; the literal meaning is “under going,” and Nossack uses it the way it is generally used: for the sinking of a great ship. *** The explanation Grayling seems to prefer for the puzzling increases in German wartime production was that the Nazi command economy may have had a good deal of slack — room for efficiency improvements — before the war. NOTE: This review was adapted and expanded from a version published to “Visual Bookshelf”/ReadingSocial; however, I may do more with LibraryThing as I figure out ways to integrate that here. EDIT, 6/18: “(While Grayling draws…” sentence and ref. to 2d footnote added. Thanks, Nell. Having answered Jim Henley‘s call, Nell Lancaster has graciously tagged me, Gary Farber, and JanInSanFran with the task of supplying text — to wit, the 6th, 7th, and 8th sentences on page 123 — from the book closest to where each of us is sitting. I hear and obey — and tag eRobin, Avedon Carol, Tom, and Paul in turn. After the left in [Chile and Indonesia] had been obliterated by regimes that Ford had helped shape, it was none other that Ford that funded a new generation of crusading lawyers dedicated to freeing the hundreds of thousands of political prisoners being held by those same regimes. I once threatened to try to write about this excellent book, but by now I’d need to reread it to do it justice. The book enraged many libertarian writers for its well-documented portrayal of Milton Friedman as the intellectual godfather of Pinochet/Argentine style economic warfare — and hence of the repression that went hand in hand with that warfare. Yet Klein’s critique of the Iraq disaster bonanza ought to have rung a bell with many of those same writers, if they got that far. I actually finished that book a while ago; in case this is supposed to be about the book I’m reading, that one is “Arsenals of Folly: The Making of the Nuclear Arms Race,” by Richard Rhodes. The text is from a 1984 address by Jerome Wiesner, arguing that it would take just 50 nuclear weapons to put American or Russian society “out of business,” and 300 to destroy it. It would take a bigger bomb for Los Angeles or New York. If you are a weapons expert you know you should “pepper ’em down”; you would get a better effect. In any event, it does not take many. As Joseph Cirincione points out in his review of the book**, the United States and the Soviet Union had a combined 65,000 warheads at the height of the Cold War — and still have 25,000 today. I actually happened to talk with Cirincione about the book, and mentioned that one thing I thought about it was “what about us?” — by which I meant the Nuclear Freeze movement that I spent a great deal of time in during the 1980s. Rhodes’s book spends a great deal of time focused on Reagan and Gorbachev — their head-to-head negotiations in Geneva and Reykjavik, even a chapter length bio of the Russian leader. But Rhodes barely acknowledges or discusses the mass movement that opposed a U.S. nuclear weapons buildup, or even the congressional donnybrooks over MX missile deployment that were defining moments of the Reagan years. I suppose that would have complicated the scope of the book, but whether it’s intended or not, the omission seems to signal that we didn’t matter. If so, I would beg to differ, even if I can’t prove a causal connection between the Freeze and eventual successes like the INF and CFE treaties. There was a time when nearly every Congressman or -woman was deeply aware of nuclear weapons and of their constituents’ beliefs that there were too many of them and we didn’t need any more of them. Like the narrator in “Masters of War,” we spoke out of turn, and we won those victories, too — even if we’re still in the shadow of thousands of remaining nuclear weapons. * Hers was quite unusual and interesting, you should have a look. ** Along with three others, which are more about Pakistani/A.Q. Khan proliferation. EDIT, 3/5: Final sentence of Klein discussion split into two sentences, ‘if they got that far’ added to 2d. Also, “impoverishment” and “economic warfare” moved to the first spots in prior sentences, ahead of “repression”; I’d summarize much of Klein’s point as being that the order matters, just as the motive matters in any crime. EDITS, 3/6: 25,000, not 26,000; the other 1,000 are divided among the other nuclear powers. Also, on re-reviewing the index, I found 3 references to the nuclear freeze movement; the effect in the text is that Rhodes “barely acknowledges” rather than “doesn’t acknowledge” it. Here’s a list of books I’ve read (or am reading) that I can recommend; one of them might make a nice book for you, or maybe a nice gift for someone else this Christmas. The list is heavy on current affairs, history, historical fiction, and science fiction. There’s nothing in the list that’s terribly eclectic — you’ll have seen most of these books at your local bookstores over the past ten years or so — but maybe one or the other item will be new to you. Links lead to Powell’s Books; if there is a great deal purchased this way, (1) I’ll be astonished, and (2) I’ll get a small commission on each purchase. So that we’re all absolutely clear: I pledge to spend anything I make this way on some combination of cheap entertainment, girls, and of course more books. PS: don’t use FedEx! American Rights at Work explains why. More than likely, Tisquantum was not the name he was given at birth. In that part of the Northeast, tisquantum referred to rage, especially the rage of manitou, the world-suffusing spiritual power at the heart of the coastal Indians’ religious beliefs. When Tisquantum approached the Pilgrims and identified himself by that sobriquet, it was as if he had stuck out his hand and said, Hello, I’m the Wrath of God. So little evidence has emerged of Indians fertilizing with fish that some archaeologists believe that Tisquantum actually picked it up from European farmers. The notion is not as ridiculous as it may seem. 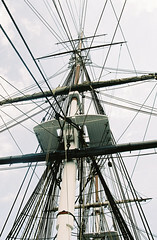 Tisquantum had learned English because British sailors had kidnapped him seven years before… In his travels, Tisquantum stayed in places where Europeans used fish as fertilizer, a practice on the Continent since medieval times. By fall the settlers’ situation was secure enough that they held a feast of thanksgiving. Massasoit showed up with ninety people, most of them young men with weapons. The Pilgrim militia responded by marching around and firing their guns in the air in a manner intended to convey menace. Gratified, both sides sat down, ate a lot of food, and complained about the Narragansett. Ecce Thanksgiving. However, I insist on believing there were cranberries. Happy Thanksgiving! Three quizzes provide you, my readers, with a window into my very soul — and one gives you a chance to change it! I also rate as a “passionate foot soldier“: “You readily engage in political debate but are apt to bail out before things get too testy.”Hey, no I don’t! Well, maybe I do. Trouble was, one of those questions was about putting up an even bigger Hillary sign after a hypothetical neighbor puts up a Giuliani sign, and I’m just not there yet. For “Which Founding Father Are You?” I guessed “Benjamin Franklin”, but that choice came in third behind Jefferson and the number one choice, James Madison. One of the key things about the alternate universe of “The Golden Compass” is that people there have something like external souls; called “daemons,” they are constant companions or familiars in animal form that change during your youth depending on your state of mind, but settle into a permanent form reflecting your personality once you’re an adult. At the movie web site, you can take a kind of Myers-Briggs test — e.g., “You generally go with the flow”: strongly disagree, etc. — to learn the form of your daemon. We seem to be a cat family: my little girl got a snow leopard and my wife got an ocelot. In a kind of reflection of how daemons are initially changeable, you can click on the image to the left to influence the final form of my daemon. I got “tiger” two out of three times now, but the first time I got… a mouse. Given the rest of my family, that would just prove I like to live dangerously, so there. * According to Akhil Reed Amar (“The American Constitution: A Biography”), Jefferson would have lost to John Adams in 1800 without the electoral votes supplied by southern slave populations under the notorious “3/5” rule. ** I use simple possessives such as “hers” instead of “hers under prevailing notions of property rights at that time” for convenience. *** She also wonders why anyone would pick Mrs. Coulter as a name. We haven’t got that far yet. UPDATE, 7/18: Interesting — after reader input, my daemon has cycled from “tiger” to “mouse” and now “lion”, but I remain “modest, responsible, shy, sociable, and solitary.” Do I contradict myself? Very well, then I contradict myself, I am large, I contain multitudes.